Game? What game? I'm thinking more about the two feet of snow that dropped in the Rockies not who's going to win Super Bowl XLVIII (that reminds me, I still have to enter my friend's pool). I'm guessing I'm not the only skier mulling these thoughts, especially the Colorado ones who could have used what's being called the storm of the season to call in sick with the powder flu. Think about it: The Super Bowl couldn't be more perfectly timed with a ski day. Most resorts stop their lifts at 4 p.m. and the kickoff is at 4:30 p.m., mountain time. Plenty of time to ski a final run before dashing into a slope side bar to watch the Denver Broncos face off against the Seattle Seahawks. And extra calories in the bank for more beer and wings that you know you'd eat regardless of whether you skied, ran or did nothing all day. Besides, with all the snow falling, how could you want to leave the mountain early? If you want to maximize your Super Bowl weekend, one of your best bets is to head to Crested Butte Mountain Resort (CBMR) where they're making the most of the Broncos quest for the Lombardi trophy. 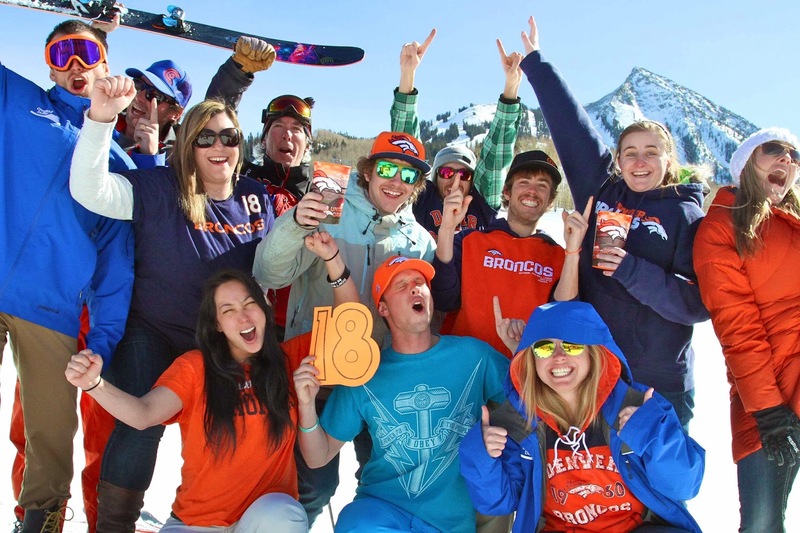 Over the weekend, you'll find everything from discounted lift tickets for supporting the Broncos to a tailgate party complete with a wing-eating contest and giveaways. Here's how skiers can reap the benefits when Crested Butte gets into the game day spirit. Wear orange on your outer layer and CBMR will sell you a lift ticket for $48 on Saturday, February 1. A Tailgate Party starts at 3 p.m. Saturday at Butte 66. If you're wearing orange, you'll score free beer until the keg runs out. Butte 66 hosts its annual Super Bowl Party on Sunday with 50 cent wings, barbeque specials, a wing-eating contest at halftime and giveaway specials throughout the game. Stay until Monday when the price of the full-day lift ticket will be based on the final combined scores of Sunday's game. The price will be determined by $1 per point scored, but it will max out at $59. If the final score is Broncos 24 and the Seahawks 21, the price of a lift ticket for Monday, February 3 will be $45. The resort received 26 inches of snow in the last 48 hours, with 22 of those inches falling in the last 24 hours (as of Friday, Jan. 31). Powder anyone? For a full list of discounts and festivities for the Big Game weekend, visit www.skicb.com/biggame. Who's skiing and then Super Bowl-ing? Are you rooting for the Broncos or the Seahawks? Great write up and wonderful post i love to read your post very much. A big thanks for sharing with us !! Thanks, dosing unit! Happy to share though I think all of Colorado wishes the Super Bowl outcome was different.